What is the Oriental Buddha Park? Open to the public in 1994, Oriental Buddha Park offers thousands of statues of Buddhas with different postures and even different shapes to visitors to explore. Through excellent skills, every statue looks lifelike. They are made of stone, bronze, or painted clay. Covering an area of some 66.66 hectares, Oriental Buddha Park is situated on the Nine Hills of Lingyun. In the Tang Dynasty (618 - 907), there were temples on each hill. However, temples on four hills of the nine hills were destroyed during the anti-Yuan Dynasty war at the beginning of the Ming Dynasty (1368 - 1644). You can admire the largest sleeping Buddha in the world which is 170 meters long. The Buddha was carved on a wall of a hill. The trees on the top of the hill looks like a blanket covered on the Buddha. Ten Thousands of Buddhas Cave is a must-visit around the park. You can appreciate various shapes of statues, including Bodhisattva, arhat, and Buddhas from all over the world. In addition, you also can discover Demons Demolished Pood (降妖池). There is a seating statue of Sakyamuni and the statues of three demon girls in the pond. The Buddha Bay (佛湾) is surrounded by peaks in three directions. There, you can discover the statues of Buddhas with the characteristics in the Northern Wei Dynasty (368 - 534) and the Song Dynasty (960 - 1279). You also can immerse yourself in the natural beauty. 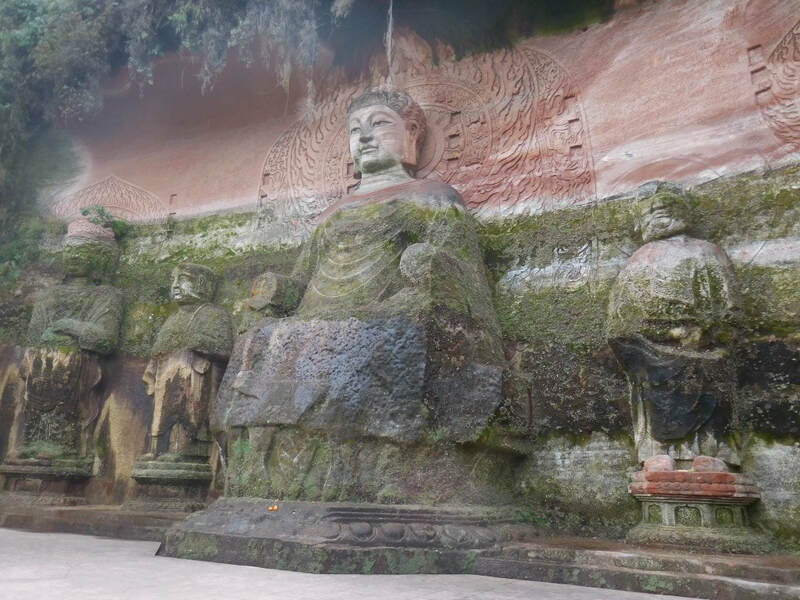 Compared to Leshan Bid Buddha, Oriental Buddha Park is less famous with fewer visitors. The best time to visit Oriental Buddha Park is in the morning. There are only Bus 3 and Bus 13 from downtown Leshan to the park. Therefore, there are only a few options. Rent a vehicle to the park from Chengdu or Leshan. This is the quickest and most direct option. Take a bus from Chengdu to Leshan. Transfer to Bus 3 or Bus 13 to the park. Most of the statues were created in 1990s by 1994. Interested in visiting Oriental Buddha Park on a Tour? Wendy Wei Tours offers a variety of different packaged tours as well as custom tours including Oriental Buddha Park, among other attractions and destinations. To find out more, please visit our Tours page or Contact Us directly to find out more.